How many of you agree that curry powder that is sold in supermarkets in colourful plastic/glass container is nothing but much hyped saw dust? Curry powder!!! Not that I want to sue these stores/super markets for selling something that is totally un-Indian but given a chance I am more than willing to blow their heads off! As if it was not enough to pass the vegetables or meat that float in thick red gravy of oil as Indian curries, many a times people are misguided when it comes to ingredients used in Indian cooking. And hear me loud and clear, please be kind to yourself and your taste buds and throw that awful yellow powder into nearest bin and get a packet of fresh Garam Masala (homemade is still better) and few basic spices used in Indian cooking. Once you cook with these spices and spice powders, you will not go near the aisle that displays this saw dust in little containers. Stock up your pantry with little cumin-coriander powder, turmeric powder, red chilli powder, garam masala and you are ready to cook one pot after another pot of delicious Indian curries. While we are on the topic of cooking curries, how about keeping that bag of maida/all purpose flour away when you are making curry? I have seen many people use them to thicken the gravy. When we have much better options to try out why not use them instead of using bland, white flour? There are many better options to thicken the gravy like onion paste, fresh cream, yogurt, cashew/almond paste than chocking your palettes with maida. Use one of them or combination of two or three and you will be surprised see how creamy and delicious the curry tastes! Today, I am determined to demonstrate that we needn’t use any curry powder (not even Garam Masala) or maida to get thick, creamy gravy. What we have today is Methi Matar Malai, a delicious blend of fresh fenugreek leaves (=methi) and sweet green peas (=matar) cooked in, what else, fresh cream (=malai). 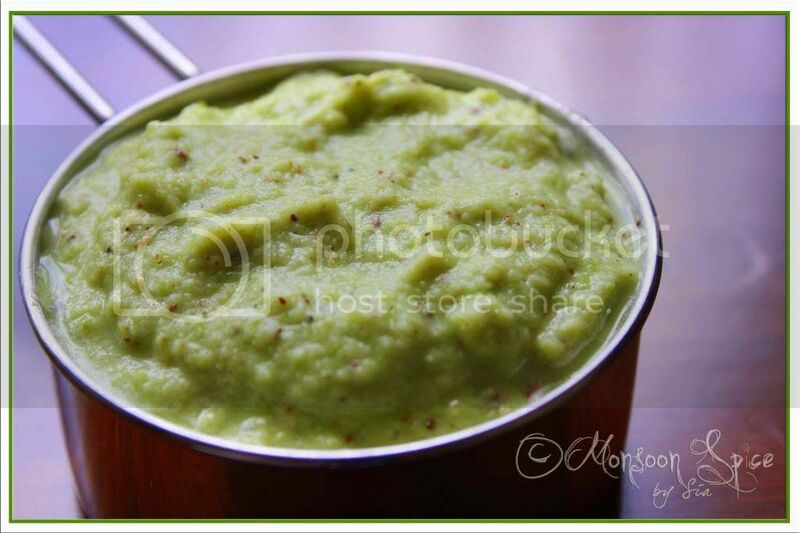 The ground paste of onions, green chilli and ginger along with whole spices forms the base for delicious gravy. The addition of fresh cream, cashews and ground green peas is what thickens the gravy. Yes, no curry powder nor maida. All we have is some fresh herbs and spices and fresh cream that sure to tickle your taste buds. If you are on diet or watching those calories, simply replace fresh cream with yogurt and you will have low fat version of this creamy curry. Looks can be deceptive! Yes, Methi Matar Malai may look like the recipe that needs you to slave in front of stove for hours after another, but in reality it is one of the simple and quick recipes that you can cook to impress your guests. And what more, you get to enjoy goodness of greens without overpowering taste of spice powder. Heat oil and add cumin seeds to it. When it sizzles and turns golden red, add ground paste and keep stirring till the raw smell of onions disappears. It takes usually 5-6 minutes for the paste to turn light golden brown and the paste should become little dry. Be patient, or else the gravy will taste bitter. Once you have cooked the paste, add fenugreek leaves and cook until the leaves are wilted, about 2 mins. Add cooked potato cubes, green peas, sugar, turmeric powder, and salt to taste and cook for 2 minutes. Now add fresh cream, ½ cup of water and mix well. Simmer the heat and bring the gravy to gentle boil. Add little water if you think the gravy is too thick for your taste. Cook for another 2 minutes. 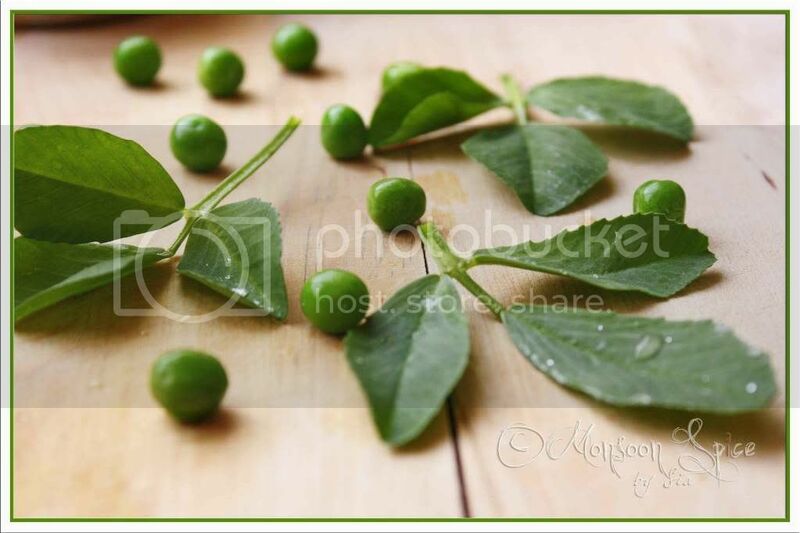 Transfer Methi-Matar Malai to serving dish and drizzle little cream on top if desired and serve hot with any Indian bread or flavoured Rice and enjoy. For low fat version of this Methi Matar Malai, replace fresh cream with yogurt. You can also avoid using cashews or replace it with almonds to get thick gravy. Or simply add ¼ cup of ground green peas that will simply thicken the gravy. But please avoid adding maida which will simply ruin the taste. You can also add ½ tsp of Garam Masala if needed. I prefer it without any overpowering taste of spice powder. Addition of sugar is optional. I add it to gently mellow the bitter taste of fresh fenugreek leaves. I love your site and am so so inspired to improve the aesthetics of my blog! Will do it soon and write back to you. Need I say I'll try out the amazing recipes and tips on your site! wow.. looks yummy sia. love the richness of this gravy. ur method is quite different... looks very good. i like the way u have kept flowers on the side for decoration. Nice MMM. But never heard of adding potatoes. As usual looks mouthwatering. I can literally taste the dish just by reading the ingredients and your write up. No garam masala or even garlic, thats my kind of a dish. But I tend to add both for my DH, but any dish where you taste all the ingredients without all the masalas and hype is my absolute favorite. Thanks for the delicious recipe. I too nodd with you for the curry powder from the stores. Mine not yours that is . Take care and have a great weekend. I have a book I am planning to read if I could get my housework done first. I agree with u, nothing can beat the fresh ground curry powder or garam masala, and methi matar malai looks yummy. Yea curry powder- didn't even know something like that existed till I came to the US. And I hate when people ask me how to make curry grrr..... I love your non-curry powder, non-garam masala methi matar malai. 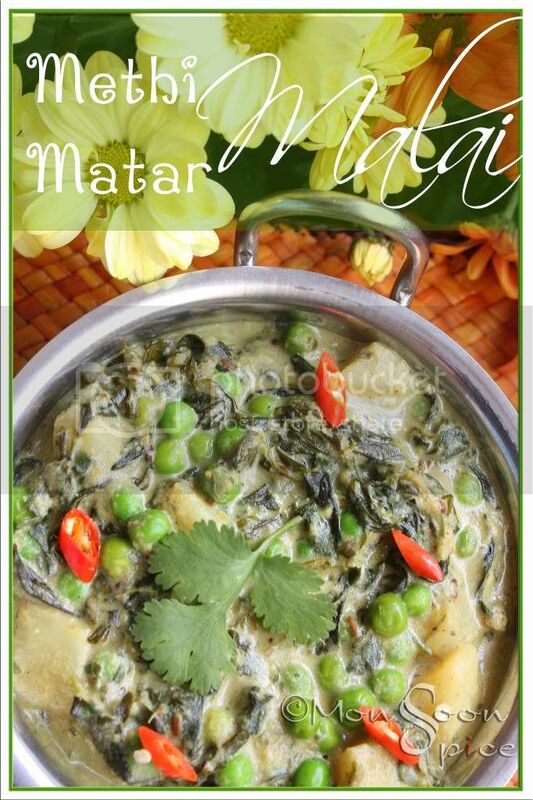 I luv this dish Sia and urs looks absolutely ravishing :)..
Methi matar looks so gud, need to try this gravy !! Awesome picture as always Sia....looks delicious. I make mine with kasuri methi as we don't always get fresh methi! I don't know who invented the curry powder and even wondering who is buying those dusted bottles! MMM looks creamy and rich, something to try soon.. Sia..This is so creamy and lovely!! can u send me this and some more of ur delcious dishes for my RCI-Lucknow..
Omg..this is a very rich gravy and i'm sure this is gonna taste YUMMM! I too hate the store bought curry powders! I never would have imagined people using maida in curries except in restaurants who want to save a few bucks - but apparently there are! Need a few more Jamie Olivers to teach them healthier and tastier options! The curry looks really nice and healthy. oh how you feeling now? hope u r better. Methi Matar Malai looks creamy and fabulous. I avoid using any flour for thickening, since I feel it affects the taste. If at all needed, I use rice flour/besan. yummy....never tried methi with matar,...subji looks so delicious,.. Ya, it's great if we make our own experimenting for making different curry powder. The same store-brought one is quiet boring. It would be great that I love to chat with u in the coffee cafe. Let my dream comes true. Methi malai looks so delicious. Must try some time soon. Oh yeah, curry powder is the most horrific thing you can do to food! I actually did a post on that a long while back when I ruined a dish using that garbage! Your recipe looks awesome, this is one of my favorite dishes... It was one of the first Indian dishes I learned to make for myself... took me forever to perfect my recipe... thank goodness, I didn't use curry powder! oh yeah, me too.. I hate those wierd smelling curry powders.. Methi malai mmatar looks creamy and rich.. I posted this in my blog too a while ago, but your recipe looks slightly different than mine.. Will have to try your way for a change.. I agree that most of those curry powder mixtures are quite "nothing". And I've never heard of maida being used as a thickening agent in Indian food. Is it a London thing? I've made methi matar malai once (Rashmi's recipe) and it was delicious. Will try yours the next time I make it. Sia ... even my guests from abroad do comment on how different everything tastes here .. I think curry powder is too hyped and the saw dust type is accepted because of the bland taste of food preffered. So they never bother/get to know about the real spices. There are a lot of people who hate curry having cooked with the saw dust! Methi matar malai looks luxurious alright. that's true, some brands are really horrible. The beauty of methi matar malai is no masala:). I will post my version soon. This looks delish :) pic is stunning as usual! creamy and super rich curry! yeah, i too have seen these curry powders! they are called curry pulver here, n sometimes 'Indish curry pulver'! they look yellow just like saw dust. how ridiculous! 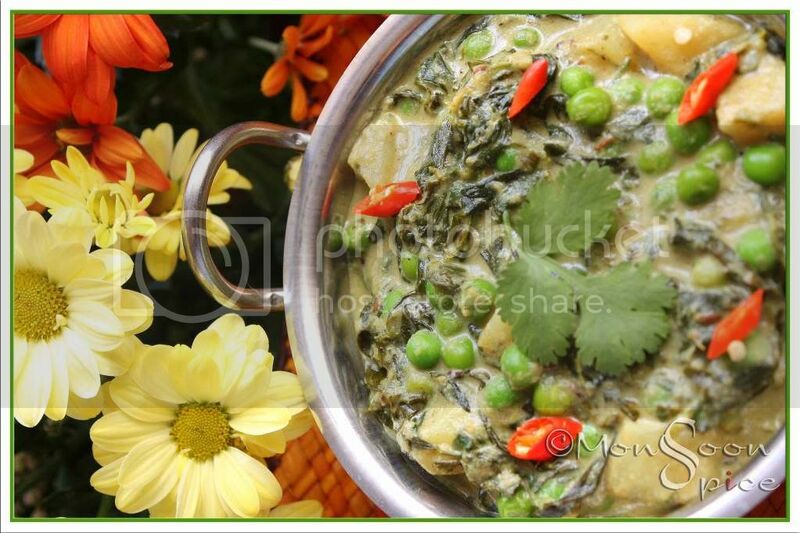 the methi matar looks delicious Sia! as usual great clicks. This is a healthy treat Sia.Looks perfect and delicious.I will surely try these.How are you? MMM is a family favourite, even my little one approves. Must try your way next, looks delicious. Thats a perfect dish. I love the way u have presented it, quite different. 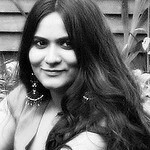 Great Blog I will definitely bookmark your blog. I am also having a blog related to food http://foodmarketnews.blogspot.com/ which gives latest analysis and trends in Food industry in the present recession period. I would appreciate if you could kindly bookmark my blog too. Made it for dinner yesterday and it came out amazing! Used almonds and the gravy was thick enough. Thanks for the delicious recipe! I'm with you about "curry powder." I'm neither Indian nor was I born in India, but I may as well be with all my Indian habits and preferences. Anyway, a friend of mine makes "curry chicken" by mixing veggies and chicken together in a pot and adding "curry powder." Sigh. I've scolded her tens of times, and she still never gets it. As I explain it to people: a.) there's no such thing as "curry powder"; what you see in the store is a British invention; b.) it's not just the spices but also the cooking techniques and ingredient combinations. As for the maida (AP flour), the technique of using AP flour comes from French cooking which uses flour toasted in fat/oil to make a "roux", which is a thickening agent. My preferred thickener is arrowroot powder (not grainy, holds up well to high heat and reheating). But, for Indian, I do the right thing and use only yogurt, nut powders, heavy cream, etc.